It’s no secret that demand for SUVs is higher than it’s ever been, and cars here in the US are passé. But this doesn’t mean that all SUVs are popular. These days, the smaller, sleeker, sometimes cutesy SUVs and crossovers are all the trend. My tester this week is old skool (with the “k” for emphasis), like Run DMC or Public Enemy. The 2018 Nissan Armada is an SUV from back in the day, when SUVs were big, boxy and brash. And I like that. Some may call the Armada a dinosaur or outdated, I call it throwback chic. That ethos comes from the Armada’s go-it-alone styling. It doesn’t resemble its trendy and fashionable smaller siblings, the Rogue or Murano. 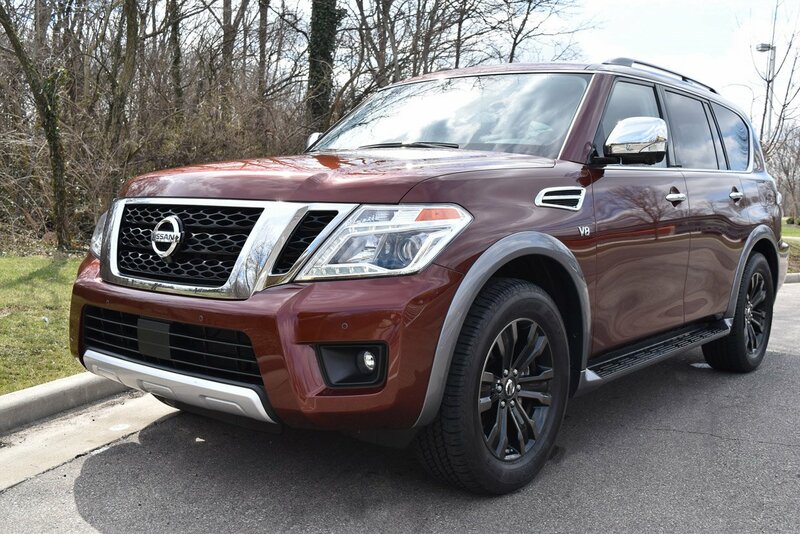 The Armada is its own beast, despite its close resemblance the Infiniti QX80, which is the more luxurious lookalike. The fact is, I like both the Armada and the QX80. The big, bold look provides distinction in a watered-down world of lookalike crossovers and SUVs. 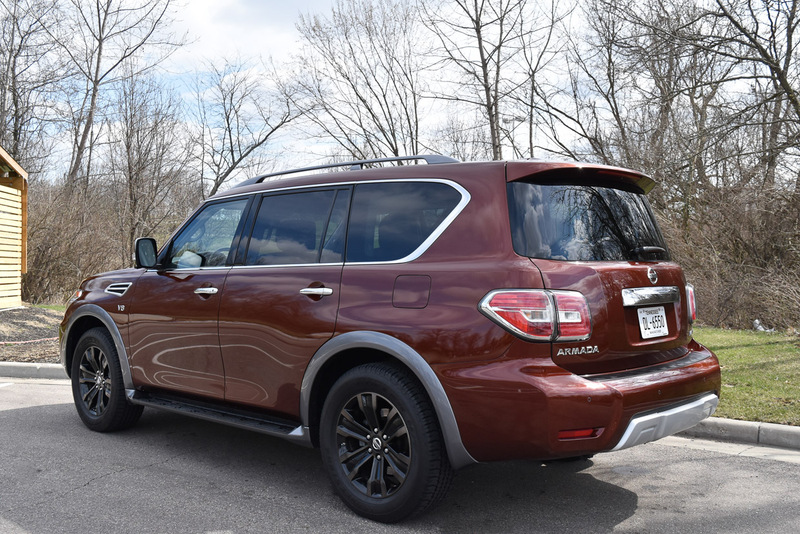 Look at the Armada with a glance or squinty eyes and you’d think you were looking at the luxury-level QX80, and that’s a good thing for a non-luxury brand. The Armada received a big update in the 2017 model year. Truth be told, in nearly a decade of auto reviewing, I’ve never driven the Armada, so it was all new to me. But the 2018 variant has an elegant look. Some of that is due to the chrome that’s found all over the vehicle. Chrome is something many car buyers have a love/hate relationship with. Put me in the chrome-loving camp. So for me, features like chrome framed windows on the Armada’s exterior play well. 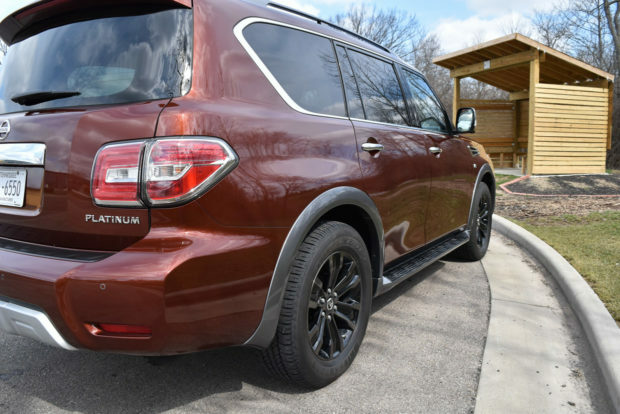 I like the faux vent that resides over the front quarter panel too, a feature the QX80 shares. 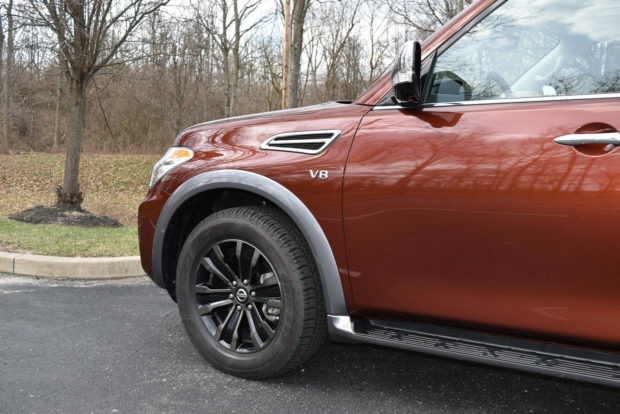 While the front end is bold with plenty of chrome, I really like the back end of the Armada, with its more subtle chrome elements like framed rear lights and a rear tailgate handle. 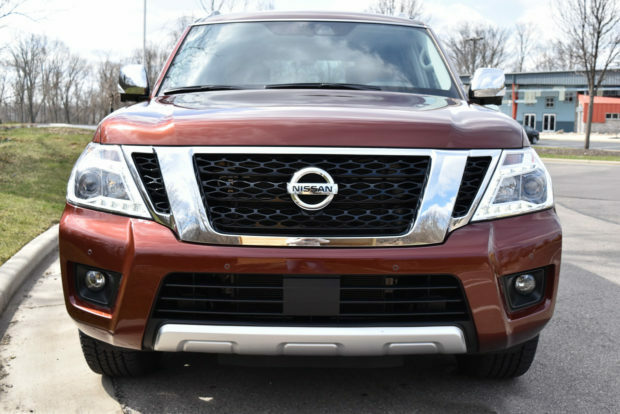 The boxy, rounded-corner look of the Armada adds to the large appearance of this SUV. It has a height of more than 75 inches, thus those running boards are very necessary to help passengers get in and out. Plus, it’s more than 208 inches long, meaning this won’t be ideal for urban environments or places with limited parking. This behemoth also weighs more than 5,900 pounds. Indeed, the Armada doesn’t (and can’t) hide from its bulky proportions. But, considering its size, the Armada handles like a smaller vehicle than those numbers would indicate. 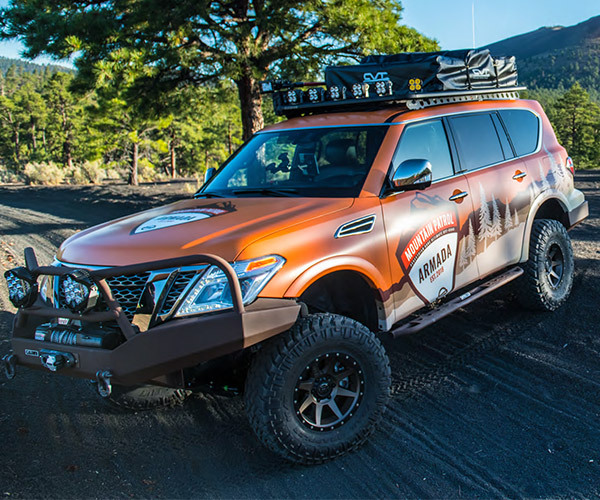 Obviously, a vehicle of this size requires a V8 engine, and the Armada has a 5.6-liter V8 with 390 horsepower. Given its weight, the Armada is a little slow off the line. Although, acceleration was smooth, aided by the 7-speed automatic transmission. It’s not a lumbering SUV, but it’s also not spry. To use a sports analogy, the Armada is like the big offensive lineman football player – he has good footwork but is more quick than fast. That agile footwork, so to speak, is due to strong, responsive steering, and a good turning radius. Competitors like the Chevy Suburban feel big, but the Armada definitely feels smaller behind the wheel. Fuel economy is definitely not a reason to consider the Armada, as it’s rated at only 13 mpg/city and 18 mpg/highway. I averaged a mere 15 mpg during my week in the Armada. It’s a gas guzzler indeed, but so are all full-sized SUVs. The braking, which is oh-so-important for a vehicle of this size, was firm but not grabby. That’s how I like SUVs to perform. Through turns, the Armada felt smooth and under control. A more powerful engine may have pulled through turns and felt less controlled. Thanks to its powerful engine, the Armada has significant towing capability. It’s rated, when properly equipped, to tow up to 7,500 pounds. Front-wheel drive is available, but for something this big, I’d always opt for the for the four-wheel drive, which is what my tester had. The minor difference in fuel economy is totally worth the extra peace of mind and control when facing unpredictable terrain and weather conditions. 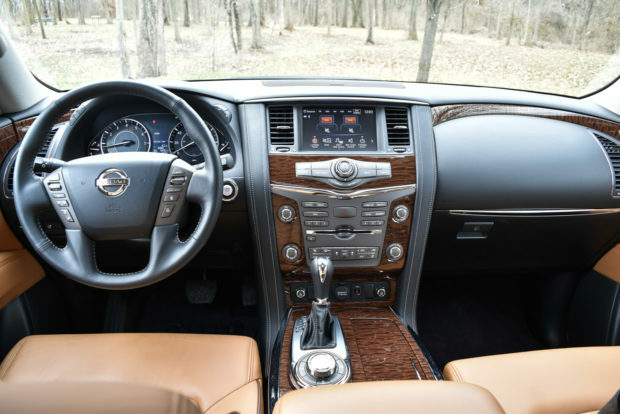 Inside, the Armada continues its resemblance to the QX80. Nissan is not a luxury brand, but the Armada has quality materials throughout and felt quite luxurious. My tester was the top-of-the-line Platinum trim, and I was blown away at high nice the Armada’s interior was. Premium leather is found on all the seats, and also on the steering wheel and gear shifter. And there’s elegant wood-tone trim on the dash and center console. The cabin is spacious, as you’d expect from a vehicle this big. The second row is cavernous with 39 inches of leg room. The higher roofline design, provides ample headroom, and three adults can comfortably fit in the second row. Accessing the third row is easy with a pull-down lever that folds a seat forward for easy access. However, the third row seat is limited and less comfortable for adults with only 28.3 cubic feet of legroom. The seven-passenger Armada is well-designed for family comfort and should provide good room for long road trips. With the third row upright, there’s only 16.5 cubic feet of cargo room. But fold the third-row seats flat and you get 49.5 cubic feet of space. With both rows folded, the Armada’s total cargo area jumps to 95.4 cubic feet, which makes it quite useful and puts this near the top of the segment. Technologically, the Armada was disappointing. Despite the 2017 update, the Armada lacks many of the basic technology features I expect from a truly modern vehicle, such as Apple CarPlay or Android Auto. There was a rear entertainment system which adds value for families, but overall the infotainment system seemed dated, although it was simple and easy to use. There are four trim options for the Armada. My tester was at the top of the trim line. The Armada Platinum has a big price tag with a starting MSRP of $61,590. This trim brings heated and cooled front seats as well as heated second-row seats. 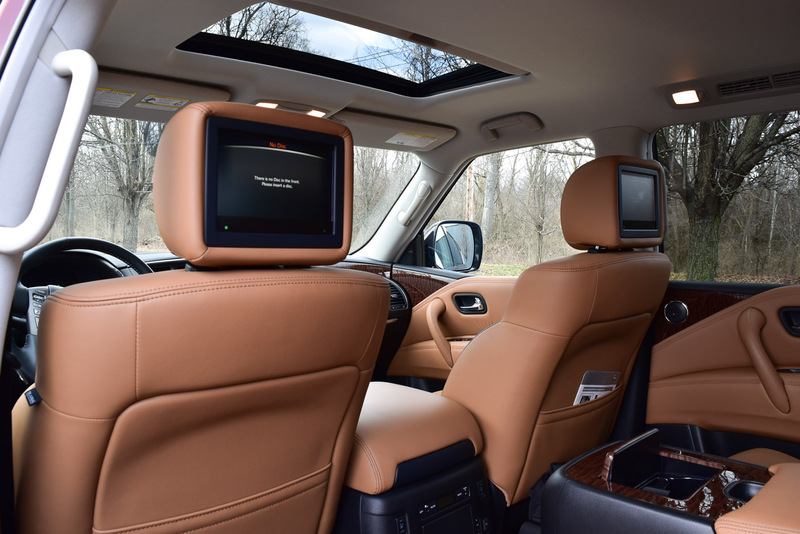 The rear entertainment package is part of this trim. There are optional captain’s style chairs for the second row, which are outstanding, and help placate passengers who might otherwise feel like someone is sitting right on top of them (take note families). 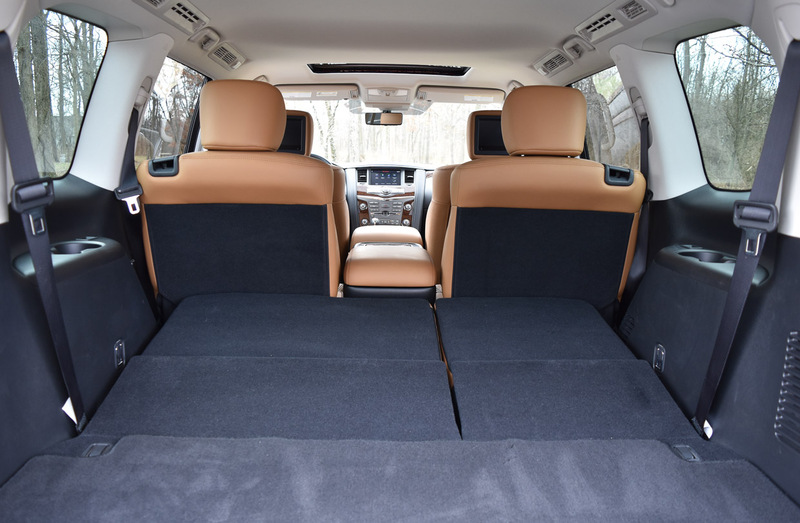 With these captain-style seats, the Armada is more appealing to families, in my opinion. The additional $450 for these seats are well worth it. My tester had a final price tag of $63,545. That number seems to encroach on luxury brand pricing, but for a vehicle this size, it’s actually quite competitive. Overall, the 2018 Nissan Armada resonated well with me. I enjoyed its beefy vibe and looks. This is how I like SUVs to be and act. Save all the frilly design and cramped interiors. Rather, let me feel like a boss on the road. And you will feel that way in the big, comfortable, old-school Armada.